A fun and modern gift which is perfect for families, couples, friends and colleagues this Christmas. 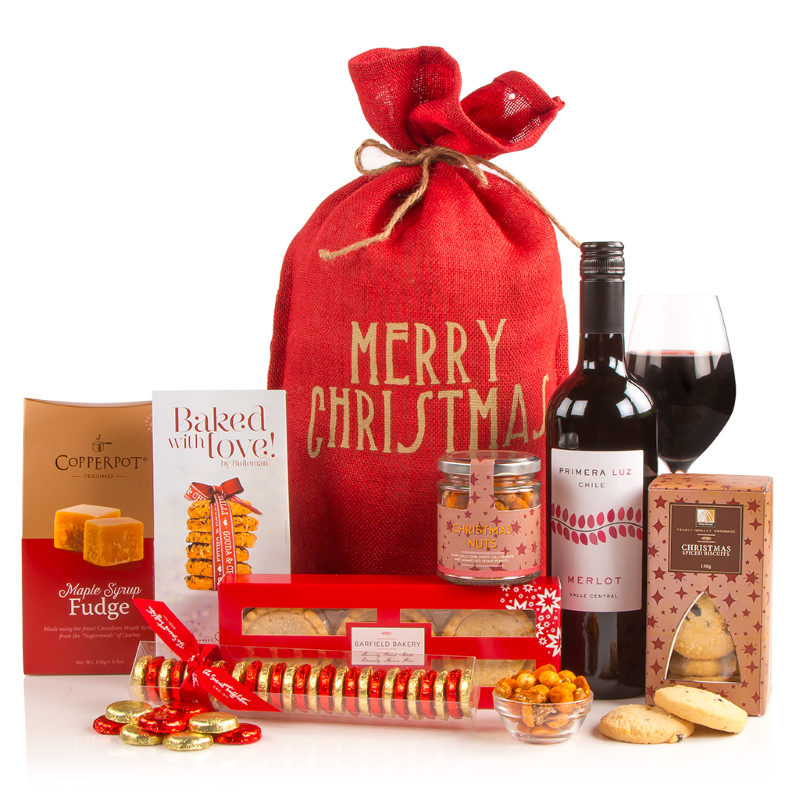 The decorated hessian bag is filled with festive indulgences including merlot, maple syrup fudge, biscuits, chocolate buttons and more. By adding this product to your basket you are confirming that you and the recipient of the product are over 18. Named day delivery is available Monday to Friday excl. bank holidays. Order before 1:00pm Monday to Thursday for next day delivery. Free Standard Tracked Courier: Your hamper gift will be delivered by one of our courier providers on the nominated delivery date, or 1-2 days after your selected delivery date (not including Saturday and Sundays) depending on your postcode. Most mainland UK addresses can be delivered to on the nominated day. Please note that fresh food hampers can only be delivered Tuesday to Friday. Deliveries between 8am - 6pm Monday to Friday.